The opening pages of Open, Andre Agassi’s ghost written autobiography published in 2009, foreshadow what is assumed to be the very end of the novel. Agassi wakes up on the floor, the morning of what is likely to be the last tennis match of his career. Immediately, the reader learn of his weakness. As he begins the tough task of standing up, he is met by the same excruciating pain that greets him every morning, a by-product of a life spent training rigorously and playing ferociously. First thing, Agassi feels the weight of his thirty-six years. He is an ancient man, at least in the timeframe of a professional athlete. This is surprising as one expects to be introduced to the incarnation of a Greek god and not a retiring cripple. On his feet, he goes over to the mirror in his bathroom peers at his face, lined by the stress and fatigue of a long career. He reflects on how the world only ever sees his game face, full of energy and concentration, never the shockingly worn one gazing back at him from the mirror. Then he stumbles into the living area of the hotel room, greeting the family he loves so much, the wife (Steffi Graff, a woman’s tennis champion) and three children that have kept him going through so many hardships. The beginning of Open portray the multitude of physical and mental elements of Agassi’s game; the spinal cortisone shots required to dull the agony are illustrated alongside the iron discipline required to face down an opponent unwaveringly, as well as the comfort of Agassi’s personal routine: his fine-tuned rackets and their precise order in his bag, his special foot-bindings and his regimen of vitamin drinks. 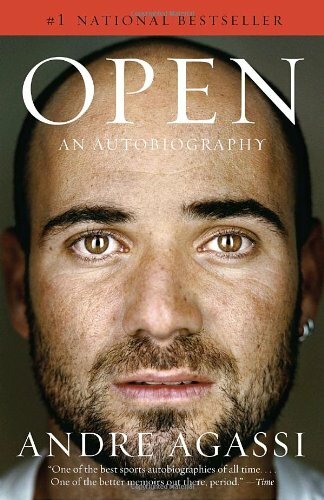 This vivid imagery, which continues throughout the book, captures the life-style, emotions and game of this elite sportsman perfectly, mirroring the driven, focused personality behind a world-class athlete such as Agassi. In particular the depth of emotion that accompagnies his life's tribulations captures the reader. The very direct and fast paced style of writing also seizes the reader's interest from the start. The rest of the autobiography focuses primarily on the pitfalls of Agassi's career. At the end of the first third of the book, Agassi is submerged in attacks over a slogan he uttered for a Canon commercial: Image is Everything. This moment is very important for Agassi’s development as a tennis player and will be a crucial factor in the successful continuation of his career. Agassi is known in the tennis world for the rebellious characteristics of his youth, traits that he has still not been able to rid himself completely. He has not yet been recognised as a tennis master as he has not yet managed to win a Slam. After this commercial, Agassi is at his lowest, the ultimate punching bag for sports writers and tennis fans. At his games fan yell the slogan mindlessly, and he starts to react, smashing his racket and responding to their taunts. Sports writers take this slogan as his confession that he only cares for the perks of tennis and not the sport itself. Agassi feels cruelly betrayed by the Canon executives, the sportswriters and his fans. However, he overcomes his frustration and, so as to prove his critics that he is not only a vapid image of a professional athlete, he decides to totally recast himself, a course of action he frequently employs in his career. He strips off the complaining, prima-donna nature, much exhibited in the rebellious, devil-may-care attitude and behaviour of his youth and finally adequately prepares his mind and body to achieve his ultimate goal: winning a Slam. Agassi soon finds a new trainer, Gil Reyes, who will coach him for the rest of his career and even become quite a strong father figure for him. With his new coach, Agassi adopts a more rigid approach to his physical training, as well as a more confident mindset, two long-needed elements which put him on the track to number one in the world and tennis renown. Yet destroying and then salvaging his public image does not mark the end of Agassi's tribulations, his greatest trial has yet to come. Despite having captured a few Slams, he falls into a slump: losing games one after another; swearing at linesmen, umpires and refs, a habit which resulted in his disqualification from a tournament; behaving obnoxiously on the court; and finally hitting rock bottom by partaking in drugs with his friend Slim. This event represents another major turning point in Agassi’s career and life. Agassi’s game was severely impacted, as frighteningly quickly he lost much of his skill, feeling thoroughly out of practice when he again starts his rigorous training regime after having stopped using methamphetamines. Once again he becomes seriously committed to rapidly overcoming this dark time in his life. He immediately cuts off his substance abuse habit before it is too late and avoids a three month suspension by lying in a letter to the ATP, writing that he mistakenly drunk one of Slim’s spiked sodas. Clean once more, he starts training again, putting him back on top of the tennis world. Agassi is driven and has an excellent support system of friends and coaches, so he recovers in good form in another inspirational example of a top athlete saving himself from his own vices. Open doesn’t simply end with Andre Agassi walking off the court for the last time, but this bittersweet moment is of course portrayed. Throughout the gripping autobiography, the reader learns that Agassi had always hated tennis. His father, Mike Agassi, had forced him to master the sport at an early age, training him ruthlessly on the court he had built behind their home. He had tried to do this with all his children, out of an obsessive desire to see one of them become a world class player, but only his last child, Andre, could fully realise his dream. Agassi had initially come to hate his father for this constant, brutal tennis training, as well as for the way that he made his brother feel miserable for not being up to his level. However, as Agassi grew older, he came to see that his father’s real motivation was love. An Iranian immigrate, Mike Agassi had always struggled to earn a living in the US. He had seized on the profession of world-class tennis player as the way to make sure his children were never wanting like he was. Despite his deeply ingrained animosity towards tennis, Agassi had come to love the journey it had carried him along, all the wonderful people he had befriended, all of his delicious successes and strengthening failures, all of his exotic experiences were due to his ultimate skill: tennis. As he leaves the sport behind him, the reader can clearly see that he carries all of these conflicting emotions with him into his retirement. Yet Agassi does not let his past weigh him down. He immediately consecrates himself to the betterment of his school, the Andre Agassi College Preparatory Academy, which he founded and which he dedicated to the education of disadvantaged kids. The driving force behind this academy was Agassi’s constant compassion and generosity, values whose power he came to understand as he helped his friends through the tough times in their lives. The book closes while Agassi volleys with his wife, Steffi Graf, still pondering his own identity as well as the wonderful things the future holds. I forgot about the mullet!